Umberto Eco OMRI (/ˈɛkoʊ/; Italian: [umˈbɛrto ˈɛːko]; 5 January 1932 – 19 February 2016) was an Italian novelist, literary critic, philosopher, semiotician, and university professor. He is widely known for his 1980 novel Il nome della rosa (The Name of the Rose), a historical mystery combining semiotics in fiction with biblical analysis, medieval studies, and literary theory. He later wrote other novels, including Il pendolo di Foucault (Foucault's Pendulum) and L'isola del giorno prima (The Island of the Day Before). His novel Il cimitero di Praga (The Prague Cemetery), released in 2010, topped the bestseller charts in Italy. Eco was honoured with the Kenyon Review Award for Literary Achievement in 2005 along with Roger Angell. He divided his time between an apartment in Milan and a vacation house near Urbino. He had a 30,000 volume library in the former and a 20,000 volume library in the latter. He was a visiting professor at Columbia University several times in the 1980s and 1990s. In 1992–1993 Eco was the Norton professor at Harvard University. On 8 May 1993, Eco received an honorary Doctor of Humane Letters (D.H.L.) from Indiana University Bloomington in recognition of his over fifteen-year association with the university's Research Center for Language and Semiotic Studies. Six books that were authored, co-authored, or co-edited by Eco were published by Indiana University Press. In 1996, he was appointed Honorary Doctor of Philosophy of the University of Tartu. He frequently collaborated with his friend Thomas Sebeok, semiotician and Distinguished Professor of Linguistics at Indiana University. 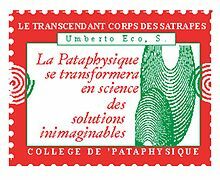 He became Satrap of the Collège de 'Pataphysique in 2001. He was Weidenfeld Visiting Professor of Comparative Literature at St Anne's College, Oxford from 2001 to 2002. On 23 May 2002, Eco received an honorary Doctor of Letters (D.Litt.) from Rutgers University in New Brunswick, New Jersey. In 2009, the University of Belgrade in Serbia awarded him an honorary doctorate. Eco was a member of the Italian skeptic organization Comitato Italiano per il Controllo delle Affermazioni sulle Pseudoscienze (Italian Committee for the Investigation of Claims of the Pseudosciences) CICAP. Eco's short 1961 essay "Fenomenologia di Mike Bongiorno" ("Phenomenology of Mike Bongiorno", then the most popular quiz show host in Italy) received much notoriety among the general public and has drawn endless questions by journalists at every public appearance by Eco; the essay was later included in the collection Diario minimo (1963). His book Apocalittici e integrati (1964) analyzes the phenomenon of mass communication from a sociological perspective. The Island of the Day Before (1994) was Eco's third novel. The book, set in the seventeenth century, is about a man stranded on a ship within sight of an island which he believes is on the other side of the international date-line. The main character is trapped by his inability to swim and instead spends the bulk of the book reminiscing on his life and the adventures that brought him to be stranded. ^ Umberto Eco, Interpretation and Overinterpretation, Cambridge University Press, 1992, p. 25. ^ Thomson, Ian (20 February 2016). "Umberto Eco obituary". the Guardian. Retrieved 1 March 2017. ^ "Umberto Eco, academic, novelist and journalist, 1932–2016". Financial Times. Retrieved 29 June 2017. ^ France-Presse, Agence (19 February 2016). "Umberto Eco, 1932–2016". The Guardian. ISSN 0261-3077. Retrieved 29 June 2017. ^ "Honorary Fellow Umberto Eco dies | Kellogg College". www.kellogg.ox.ac.uk. Retrieved 3 January 2018. ^ "Roger Angell and Umberto Eco". The Kenyon Review. Retrieved 27 February 2013. ^ "Umberto Eco Biography". eNotes. Retrieved 23 April 2016. ^ Liukkonen, Petri. "Umberto Eco". Books and Writers (kirjasto.sci.fi). Finland: Kuusankoski Public Library. Archived from the original on 4 August 2006. ^ Farndale, Nigel (24 May 2005). "Heavyweight champion". The Daily Telegraph. Retrieved 23 October 2009. ^ "Honorary Doctors". Serbia: University of Belgrade. Archived from the original on 3 May 2012. Retrieved 11 June 2012. ^ McMahon, Barbara (6 October 2005). "No blood, sweat or tears". The Guardian. Retrieved 28 July 2009. ^ "Umberto Eco stroncato da un tumore al pancreas. Martedì omaggio al Castello Sforzesco" (in Italian). Il Messaggero. 20 February 2016. Retrieved 20 February 2016. ^ a b Gerino, Claudio (19 February 2016). 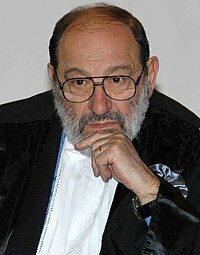 "Morto lo scrittore Umberto Eco. Ci mancherà il suo sguardo sul mondo". la Repubblica (in Italian). Gruppo Editoriale L'Espresso. Retrieved 19 February 2016. ^ "Umberto Eco, Italian author of 'The Name of the Rose,' dies at 84". Reuters. 20 February 2015. Retrieved 20 January 2016. ^ "Italian author Umberto Eco dies aged 84". The Guardian. 20 February 2016. Retrieved 20 February 2016. ^ "Remembering Umberto Eco". The Atlantic. Retrieved 19 February 2016. ^ Kandell, Jonathan (19 February 2016). "Umberto Eco, 84, Best-Selling Academic Who Navigated Two Worlds, Dies". The New York Times. Retrieved 23 April 2016. ^ Strangelove, Michael (2005). The Empire of Mind: Digital Piracy and the Anti-Capitalist Movement. University of Toronto Press. pp. 104–5. ISBN 978-0802038180. ^ Bondanella (2005) pp. 53, 88–9. ^ Clee, Nicholas (27 May 2012). "This is Not the End of the Book by Umberto Eco and Jean-Claude Carrière – review". The Guardian. Retrieved 21 February 2016. ^ fveltri (18 June 2015). "About idiots and churnalism". News of PR Interest. Retrieved 23 April 2016. ^ "Umberto Eco: 'Con i social parola a legioni di imbecilli'". LaStampa.it. Retrieved 31 May 2017. ^ Genis, Daniel. "Driving Umberto Eco". www.airshipdaily.com. Retrieved 2 May 2015. ^ Vegetal and mineral memory, EG: Ahgram, November 2003, archived from the original on 1 February 2004, retrieved 1 February 2007 Considers, among other things, encyclopedias. ^ Eco, Umberto (1985). Reflections on The Name of the Rose. Translated by W. Weaver. London: Martin Secker & Warburg Limited. ^ Eco, Umberto (1986). The Name of the Rose. New York: Warner Books. p. 10. ISBN 978-0-446-34410-4. ^ Doyle, Arthur Conan (2003). Sherlock Holmes: The Complete Novels and Stories Vol 1. New York: Bantam Books. p. 11. ISBN 978-0-553-21241-9. ^ Canby, Vincent. "FILM: MEDIEVAL MYSTERY IN 'NAME OF THE ROSE'". Retrieved 23 October 2018. ^ Ian Thomson, Evening Standard, 12 November 2015. Lila Azam Zanganeh (Summer 2008). "Umberto Eco, The Art of Fiction No. 197". Paris Review. Summer 2008 (185).